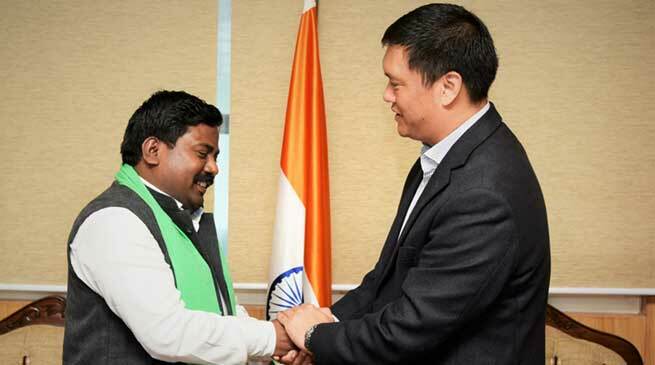 Committee on Nivedan, Zero Hour and Non-Government Resolution of Jharkhand Legislative Assembly headed by its Chairman Jai Prakash Bhai Patel called on Chief Minister Pema Khandu at the latter’s offices here this morning. The Committee is on three-day visit to the state as part of its study tour to the North Eastern states. Interacting with the Chief Minister, Patel, a first time visitor to the state, lauded the beauty of Arunachal Pradesh and suggested it can become a tourist hub of the country. Talking about his visit to Ganga Lake earlier in the morning, Patel said it had all the scope to be turned into a tourist attraction. “A little bit of planning and beautification is all needed and the natural lake could be the best attraction in the state capital,” he said. Explaining the objective of their visit, the Committee Chairman informed that study tours were mandatory for committees constituted by the legislative assembly to learn the functioning and procedures of legislative assemblies of other states for comparison and improvement in the functioning of their legislative assembly. “We have 18 Jharkhand Legislative Assembly committees for different sectors,” Patel informed. He also congratulated Khandu for being the youngest chief minister in the country and expressed hope that under his leadership Arunachal Pradesh will develop in leaps and bounds. He also invited Khandu to visit Jharkhand whenever time permits. Meanwhile, Khandu welcomed the Committee members to the state and wished them a pleasant stay. He urged Patel, who was accompanied by wife and daughter, to visit Arunachal Pradesh at leisure and visit places of interest in the districts. Also present during the interaction were PHED&WS and IPR Minister Bamang Felix, Parliamentary Secretary for Tourism P D Sona and officials from the state Legislative Assembly secretariat.